Learning to read is a lengthy process, but at the same time, it is very crucial. As a teacher and a parent, it is necessary for you to foster lifelong reading skills in the children. Each child is different from the others and so is his learning capacity. Therefore, we need to put every child’s needs in perspective while teaching them. It is a vital skill in finding a good job when a child is ready. It helps the mind develop into its full ability. Reading enhances one’s imagination and helps him/her develop critical thinking. Whether it is a newspaper or a packet of chips, you can help your child identify words that are common. Children learn about things when they see them on a regular basis. Make your child or student learn the sounds of each letter. Once they learn how to do this, they will be able to put the words together. You can introduce games while making the students read. For example, you can write names of fruits and vegetables on chits and distribute them amongst the students and tell them to act. You can make the students act in the classroom. The plays can be related to various chapters that you are teaching in the classroom. The students will go through the lessons and will be able to understand on their own. 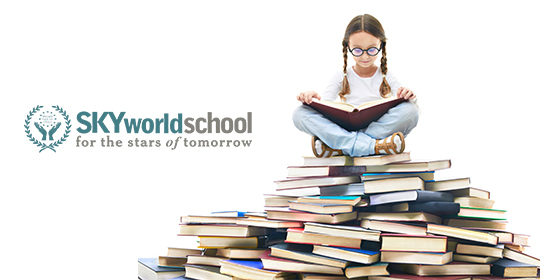 As the top school in Panchkula, at Sky World School, we encourage our students to read while incorporating fun activities in the classroom.